I have been watching the news of the floods in the UK with growing concern. There have been quite a few mentions of Sheffield in South Yorkshire in the news, particularly in relation to flooding. It is amazing to me to hear stories of flooding in the city because in the 4 years I lived there, I would never have guessed that that would be possible in the city. The rivers are all quite small, lots of hilly terrain, and certainly while there was rain and snow, never anything like what we are seeing on the news. 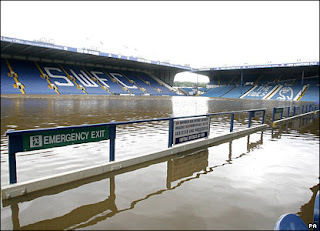 The pictures we are seeing show Hillsborough stadium pitch covered in water, people being winched out of floodwaters by helicopters, and cars basically being swamped by water. The house where we lived was built quite near to a little creek. There were quite steep banks but I can only imagine what the view out of our old kitchen window would be like at the moment. I must try and get hold of the friends that I have still there and see if they are okay. They, and the others in the affected areas, are in my thoughts. I hadn't even heard about the floods, haven't been watching the news lately. Stuff like this is always terrible! Wow that's horrible. I hope your friends, and everyone else, is OK. I hope your friends are ok Marg, unfortunately somes lives have already been lost. It's awful what has been happening. It's quite shocking something like this can happen in the UK. Hope your friends are OK Marg. I didn't realize there was flooding in the U.K. Hope your friends are all safe.